Minot and completed her pre-Masters in Speech Pathology. From there she went to the University of Minnesota in Duluth and graduated with her Masters in Communication Disorders. She works as a Speech Language Pathologist at a rehab center and at a school in Riverton, WY. On August 16, 1997, she married Mike Osborne who has a trncking business in Wyoming. They built a log home on their land west of Riverton, WY in 1999. Michael Stephen (Mike) was born on June I, 1969. After grade twelve he took the agricultural course at the University of Manitoba for two years and then went to work in Inuvik, WT for six years. 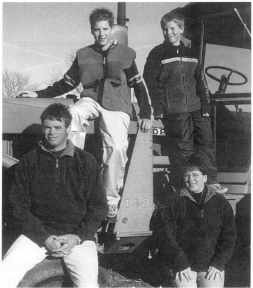 He came home to farm in April of 1996 and farms with his parents. On May 24, 1999 Mike married Andrea MacLean from Sydney, Nova Scotia. Mike met Andrea while he worked in Inuvik, NWT. They now live south of Erickson. Andrea is a Registered Nurse and works at Erickson and District Health Centre and farms with Mike. Roxanne Rita was born July 9, 1970. After grade twelve she worked for a year and then took a dental assis­ tant program at Keewatin Community College in The Pas, MB, and worked in Winnipeg for eight years. On June 27, 1992 she married David Hislop from Gillam, MB. They live in Winnipeg and have a daughter, Vanessa Amy, born May 29,1997. Roxanne decided to become a dental hygien­ ist and enrolled at the University of Manitoba in 1998. She will graduate in the spring of 2000. Dave works for Manitoba Hydro. Sharon Leona was born October 19, 1972. After grade twelve she worked for a year and then took Business Administration at Assiniboine Community College in Dauphin and Brandon. She worked at McMunn & Yates and then at Avco Financial Services in Brandon. Sharon married Kevin Coughlan from Killarney on May 25, 1996. (She won't forget the leaves were not out yet that spring!) They live in Brandon and Sharon continues to work for Avco, now known as The Associates Financial Services, and Kevin manages McMunn & Yates Roofing and Drywall. Editor's Note: Gloria's daughter, Julia Marion, was born April 24,2000. Sharon and Wybo Vanderschuit moved to the area from Jasper ational Park in 1990. The following year they were able to purchase the beautiful piece ofland that had been the Philip Gusdal homestead since 1911. 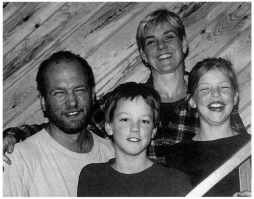 In the spring of 1993 Sharon and Wybo moved into their new log home with their children, Cal (2 yrs.) and Libby (1 yr.). Sharon (Abbott) was born and raised in Winnipeg but spent summers at the family cottage on Lake ofthe Woods. Wybo and his parents came over from Holland when he was 2 years old and he grew up by the Rideau Lakes in eastern Ontario. After completing their university degrees, Sharon and Wybo each found exciting careers in Canada's National Parks. Their paths eventually crossed in Winnipeg and they were married in Jasper a year later. Both Cal and Libby were born in Brandon and are enjoying life "on the ranch", Raven Oaks. One of these days we'll get a couple of horses. For now we're keeping busy with the many recreational activities the area has to offer. All four of us have found many good friends and are proud to call this beautiful part of western Manitoba home.